PARAMUS – After more than 165 minutes without a goal to open the season the pressure was starting to mount on Paramus Catholic. After a scoreless tie in the opener against Mount St. Dominic the Paladins were locked in another one deep into the second half against upstart Fort Lee. Needing a spark, PC found it just in time thanks to some senior leadership. One of Paramus Catholic’s four senior captains, Dana Sabato, took a feed from fellow captain Tanaya Perez and hit a perfect 25-yard shot that dipped just under the crossbar. 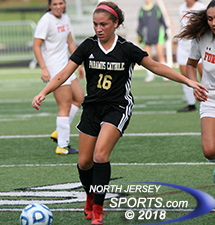 Five minutes later, they reversed roles with Perez hitting a nearly identical shot from the same spot as Paramus Catholic notched its first win of the season on Thursday afternoon with a hard-fought 2-0 verdict over Fort Lee. During the game’s first 30 minutes Paramus Catholic controlled the midfield. However, that did not translate to many scoring opportunities thanks to an organized, hard-nosed defensive effort. Led by senior back Natalie Elmers and a pair of saves from goalie Vivian O’Loughlin, Fort Lee held the PC attack at bay before finding some offensive flow late in the first half. 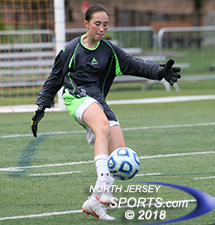 Fort Lee keeper Vivian O’Laughlin made a couple of tough saves to keep the Bridgewomen in the game well into the second half. The Bridgewomen had the best scoring chance for either team in the first half on a shot from senior midfielder Sofia Esposito. With just over a minute to play, Esposito’s shot from the top of the box cleared traffic in front and curved just over the crossbar. A similar play happened early in the second half after a nice play by Angelina Vargas to beat a defender to a loose ball along the goal line. That led to another shot that just missed over the bar. Behind the high-scoring Gabriella Garita, Fort Lee went on the attack and had several scoring chances. Paramus Catholic weathered the storm before flipping the switch near the midway point of the second half. O’Loughlin made a pair of tough saves from point-blank range to keep the PC off the scoreboard. It was only temporary, however, as the Paladins kept putting shots on frame before finally cashing in. Sabato took a pass from Perez, took one dribble to her right and struck a right-footed shot that bent just over the outstretched leap of O’Loughlin and under the crossbar in the 66th minute for PC’s first goal of the season and a 1-0 lead. Tanaya Perez scored the second goal of the match for Paramus Catholic, which improved to 1-0-1 on the season. Once the Paladins found the back the net they were hungry for more. After waiting 165 minutes for their first goal it took just over five minutes to notch their second. Perez and Sabato worked a quick two-touch combination pass with Perez ripping a shot into the upper right-hand corner to make it 2-0. Donnelly made four saves to earn her second shutout of the season for Paramus Catholic (1-0-1). The Spartans also received solid play along the back line from Daniella Carrion and Teresa Paz. O’Loughlin made nine saves for Fort Lee (2-1). The Bridgewomen have not had a winning season in nearly 20 years, but with a talented squad that is still young this could be the season that all changes. Paramus Catholic has a tough stretch of games ahead, including matches against DePaul, Morris Knolls, Ramsey, and IHA. But with win No. 1 under their belts, the Paladins are hoping this win gets them going in a positive direction that will carry them through some tough opponents.